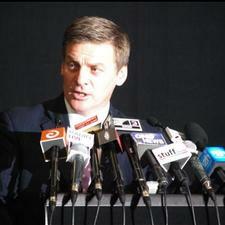 Finance Minister Bill English's second budget is an exercise in minimalism in everything but tax. And in that respect the changes announced today have been so well flagged that there is little news today besides the sweeping income tax cuts which will take effect from 1 October. Tax cuts for all! Business tax too will drop from 33% to 28% come 1 April 2011 - coming in comfortably two years ahead of similar company tax cuts across the ditch. Balancing the income tax cuts is the expected rise in GST to 15%. The Government expects this to only result in a modest 2% increase in CPI inflation and it will compensate beneficiaries and super-annuitants with an across the board 2.02% increase in payments. Meanwhile forecast annual growth of 3% per annum for the next four years means the scary debt mountain scenarios painted this time last year have now disappeared from forecasts. In the Budget 2010 media kit fully half of the material released today relates to the tax changes. Fact sheets detail the impacts of the GST rise, the income tax cuts, compensation for low income earners, changes to rules to stop the wealthy accessing working for families, and sundry related - but relatively significant - technical changes implementing changes to depreciation rules and thin capitalisation rules applying to multinationals. Notably missing from the budget is the promised move to rebalance the investment environment away from a bias towards rental property investment. The depreciation changes do address this area - but only at the margins and are unlikely to have any real impact on the great New Zealand love affair with real estate investment. Also missing is any mention of superannuation or indications of timing for a resumption in contributions to the Cullen New Zealand Superannuation fund. The headline for the opposition is writ large - and is already in play thanks to the Government making its intentions pretty obvious in recent days. The drop in the top marginal tax rate - for income over $70,000 from 38% to 33% - rewards an important constituency of the National Party voters where it matters most. Meanwhile the GST rise is regressive, hitting the poor and vulnerable harder than the wealthy. From 1 October an earner on $120,000 a year will be getting $90 more a week in the hand vs an earner on $48,000 getting an extra $28 a week. After the GST clawback is taken into account the relative improvement in fortunes is $56 a week vs $13 a week. 4)	compensation is being provided to beneficiaries for the GST increase. Mr English tellingly pointed to a graph (see below) showing the relative levels of tax cuts in percentage terms across the income scale over the past 14 years (since 1996). 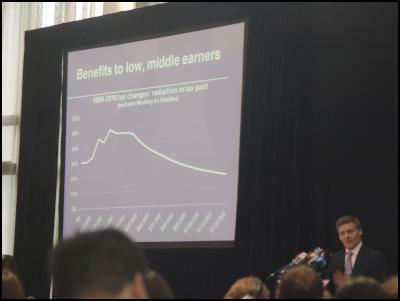 The graph shows that income earners in the $40k to $60k range have received the largest falls over this period and in presenting the slide Mr English indicated he approved wholeheartedly of this. Implicit in this was a vote of approval in the economic policies of the previous government and in all but one respect (i.e. financing them through a rise in GST) this is a set of tax cuts which might have been introduced by Michael Cullen. In answer to a question from TV3s' John Campbell on the subject English said the changes were not, "hairy chested large scale change" - and they clearly aren't. In many ways they seem relatively sophisticated and sensitive. And in a sense you could almost see them as a completion of the tax reform programme undertaken by the previous government. Asked by TVNZ's Guyon Espiner whether this was part of a programme of tax cuts with more to come in the future Mr English said no. There was a possibility of more changes to come, but "this is likely to be the biggest change we are making". In other words this completes the rebalancing. 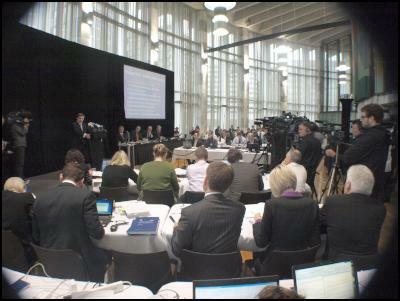 And perhaps hinting a little at another motivation for this move Mr English concluded his Q&A remarking: "We [NZ] are open for business and ready to go, and compared to everybody else [other nations] we are in great shape". 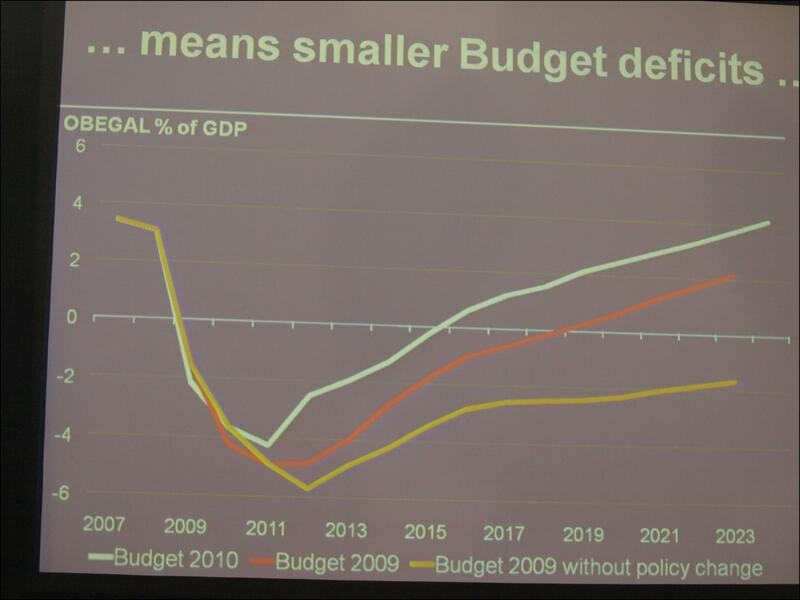 And it is definitely true that overall the fiscal position outlined in this budget has improved dramatically. The economy is bouncing back faster than expected and consequently where last year we were looking at fiscal deficits throughout the outlook period and massive indebtedness in 20 years time - the current forecast sees the NZ economy coming back into surplus in 2016 with - in global terms - a fairly comfortable looking balance sheet. And the government is hoping it can achieve that even earlier. That said there may be little bit of pollyanna in forecasts which show a NZ economy achieving consistent growth of 3% over the coming three years during a period when global debt markets are seemingly again on the precipice of another meltdown. When you look deeper into the budget - on the spending side - you find that with this Finance Minister less is most definitely less. The government has found enough cash to prevent the health system going into cardiac arrest - and some crumbs to throw at education and that's about it. The additional health funds $500 million a year will not be enough to actually relieve pressure in the health system, but should be enough to prevent it hemorrhaging - something which has in recent months been looking like a distinct possibility. The CTU forecast was that in order to flat-line NZ's health system needed an increase of $550 million a year - its received an increase of $512 million. Tertiary education funding has been topped up to actually pay for the additional students who are already enrolled (but at present are not actually being paid for) - and free early childhood education funding remains in place. Money has been saved by changing the rules so that those centers who were expecting to get increased funding to pay for fully qualified workforces won't be getting it. This seems likely to mean that the best ECE centers will have to increase their part charges or hire some non-qualified staff at lower rates to balance their own budgets. However the policy of 20 hours of ECE remains substantially in place - as do interest free student loans. On the infrastructure investment side the Government appears to have reannounced a lot of spending that they have already announced and while there is definitely a large investment underway in roading - the rest of the programme is probably not as generous or as economically forward thinking as you might be led to believe. For example $200 million for broadband vs $337 million for prisons. The other area of actual investment in the budget is research and science which has received $300 odd million over four years. In coalition government terms there are some additional wins for ACT and the Maori Party. ACT gets its economic think tank - the Productivity Commission - which looks broadly similar to the Families Commission that United Future got out of the last Labour Government, i.e. a standalone external group of policy wonks who will likely be ignored. Funding for this - as with most other new initiatives being announced, e.g. some cycle tracks being built by the Department of Conservation - will come out of existing budgets. The productivity Commission release says that its funding will come out of 29 different existing budgets. The Maori Party's big win this budget was Whanau Ora - which remains almost as opaque as it did when announced. In addition there is a few million for Maori economic development and a pilot prison rehabilitation scheme for Maori offenders in Auckland and Hawke's Bay. However the scale of funding involved in this - $5 million a year - gives a fairly strong indication of its likely impact. 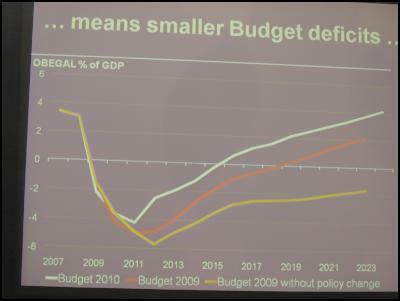 Budget 2010 is good politics well managed. Tax cuts for all will be the headline, and the business community and core National Party constituency have received their payoff and will be left happy. The most odious and unpopular part of the programme will be the GST rise, but in media terms the pre-announcement of this before Christmas has effectively minimised it, the GST debate is now old news. The tax cut package will also be a hit with financial markets - as Mr English says, to be cutting taxes while the rest of the OECD is reeling from fiscal shocks looks pretty impressive. And there is a possibility that the cuts may assist with economic growth if by no other means than simply by boosting confidence. But it is also fairly clear looking inside these cuts (73% of earners will have a top tax rate of 17.5%) that NZers basically need to earn more if we are to make any real economic progress. And this is the long term goal which the Government cannot yet afford to pursue. And as for the rest - its basically all tinkering. The social spending framework put in place by the Labour Party remains in place - well subsidised primary health care, free early childhood education, interest free student loans, working for families. Even the ongoing expansion of health spending remains intact. What Labour gave has not been taken away - yet. So this is a second budget which is calculated not to scare the horses and to ensure maximum chances of re-election in 2011. The tax cuts give the impression of progress but look underneath and they are basically a transfer of taxation burden away from the wealthy to the working classes. 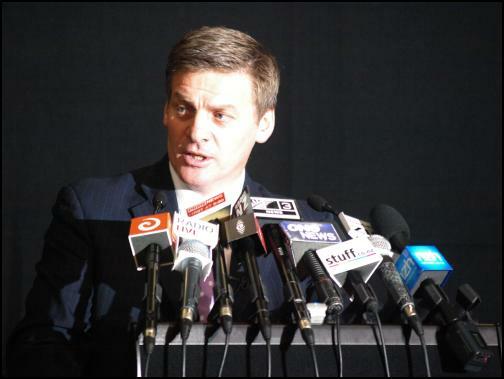 The main question which remains - given that we have stopped funding the National Super Fund and have cut revenues at a time when we already have large deficits - is will a privatisation agenda be a key component of a second term National Government?